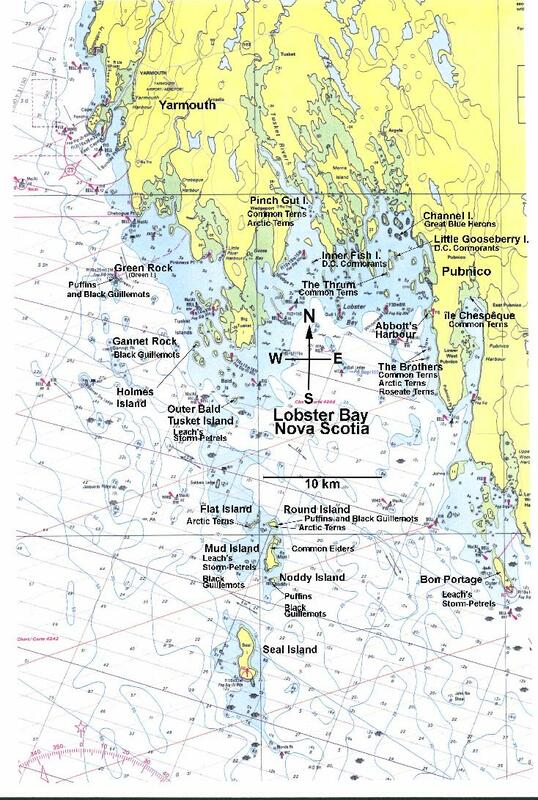 The following is a chronological listing of my 2010 work with terns in general, of the Lobster Bay area, but especially with the Roseate Terns (ROST) of The Brothers. The report also includes tern observations from other local residents. 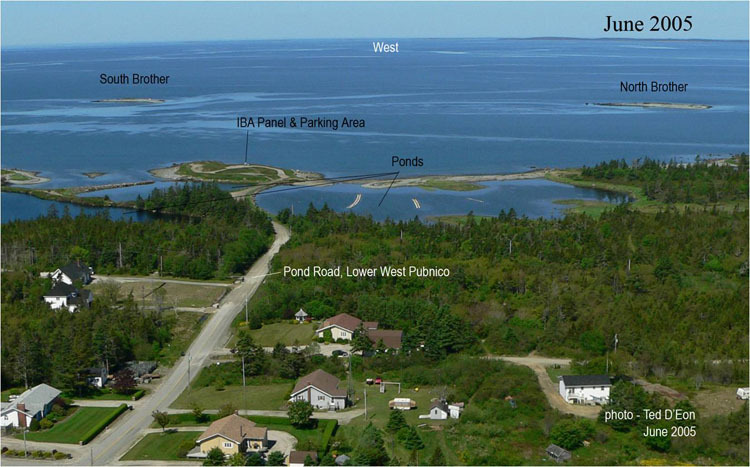 April 22, 2010 - First tern reported in LobsterBay. 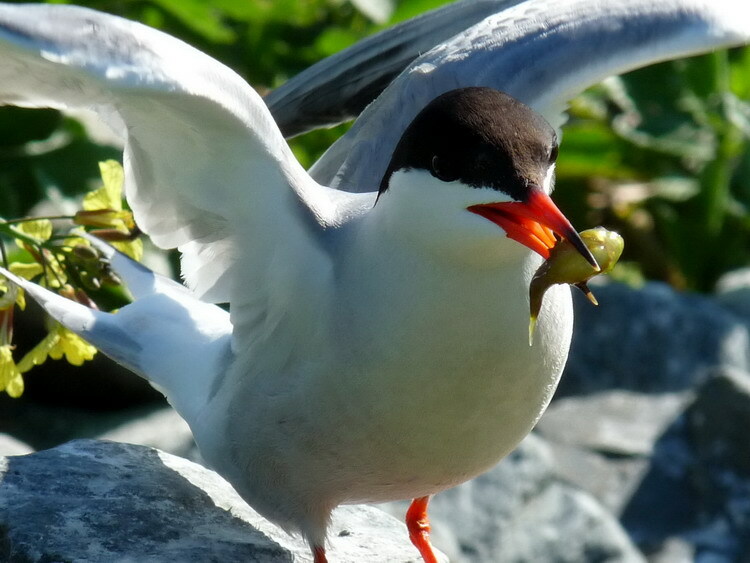 Lobster fisherman, Craig d'Entremont, reported seeing a single tern. April 26, 2010 - My first visit to The Brothers for 2010. This morning I was accompanied by Rémi d'Entremont, Israel d'Entremont and Aldric d'Entremont. 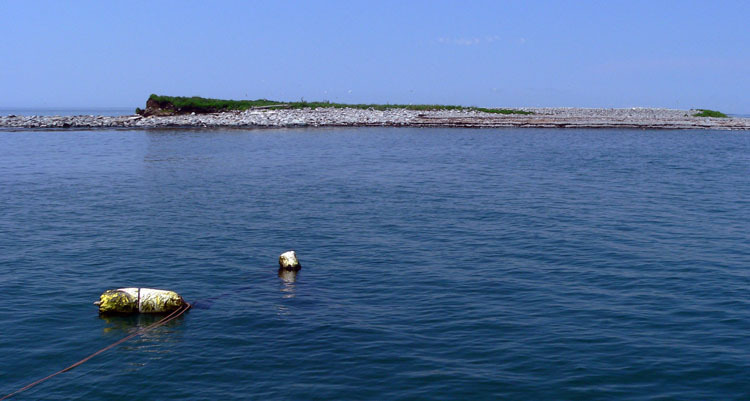 We cleaned up the Roseate Tern (ROST) nesting area of dead plant material; we added three strips of landscape fabric and 20 more new 16" x 16" ROST nesting shelters. This system has been working very well at North Brother as can be attested in this Youtube video. The video was taken with my still camera (a Lumix FZ28) on video mode in July 2009, while I was on the island to read field-readable leg bands. I found that the easiest way to get the leg band characters was to photograph the birds from various angles as they move around and then magnify the images on computer. It really works. 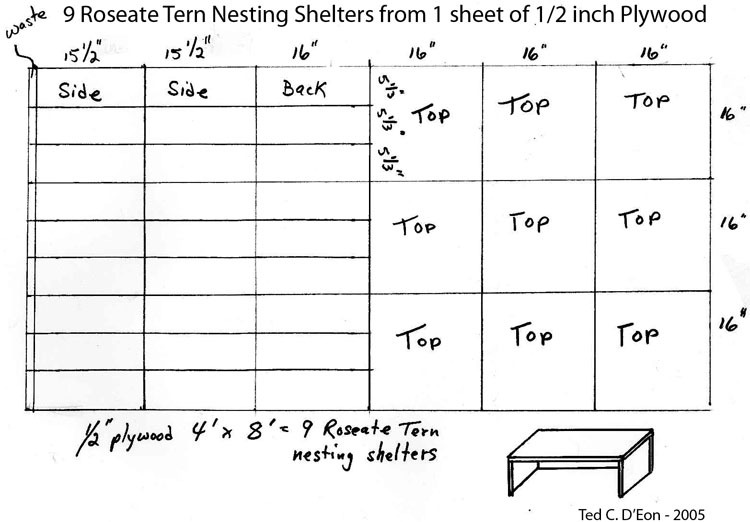 The shelters are constructed from 1/2 inch plywood, with 16x16 inch tops and three sides 5 and 1/3 inch high. One sheet of 4x8 ft plywood will produce 9 shelters. We also placed a Meadow Vole "bucket trap" baited with peanut butter, near the ROST nesting area. There was no obvious Meadow Vole activity seen. 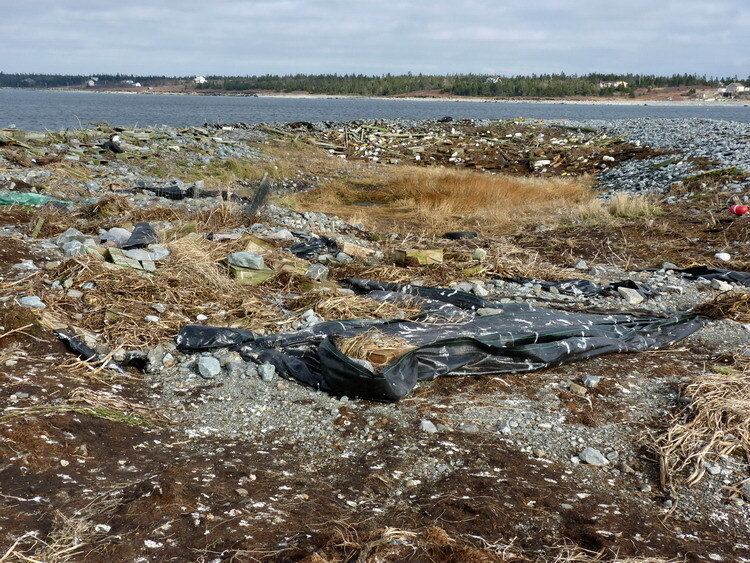 We also placed about 12 yellow tent pegs 1 metre from the south and south-west edge of the island to monitor future soil erosion. May 1, 2010 - N. Brother. 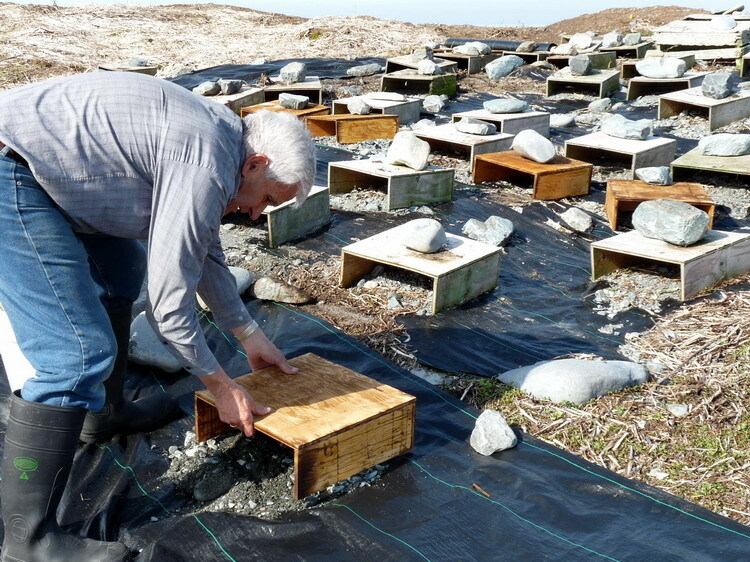 We placed another 12 ROST nesting shelters on the island. There was a dead Meadow Vole in the "bucket trap". We checked out the island for gull nests but found none. My son, Nigel, was my assistant. 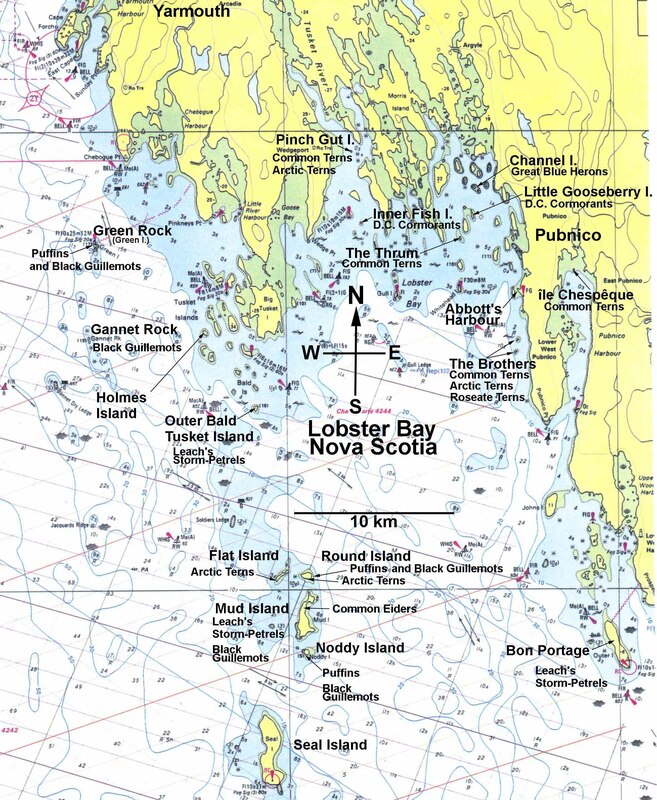 May 2, 2010 Lobster fisherman, Franklyn Surette, reported seeing "at least 75 terns above North Brother" this morning after daybreak. May 5, 2010 - About 75 terns were at N. Brother as Jean Bernard d'Entremont and I arrived on the island at about 9:30 am. 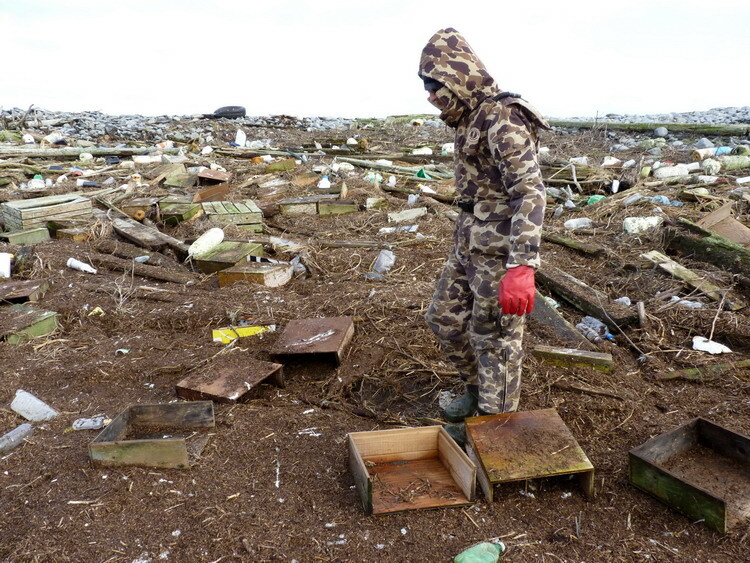 All appeared well on the island; no gull nests were found and there were no voles in the trap. We set up another 6 ROST nesting shelters, then we headed out to South Brother to see the situation there. There was one Great Black-backed Gull's nest containing one egg. Both the egg and nest were destroyed. 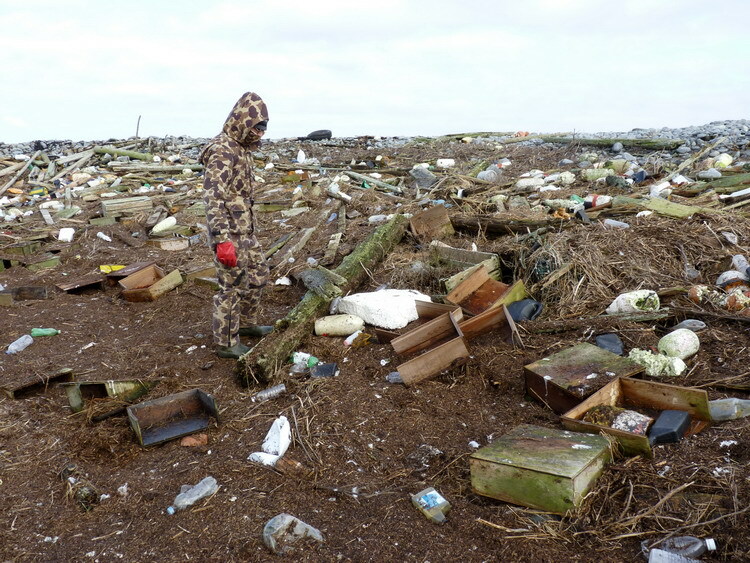 Another 3 unfinished gull nests were destroyed. I could hear a couple of terns high in the air near the island but that was the only tern presence there at the time. Two Willets were seen on S. Brother. May 17, 2010 - N. Brother. There were about 200 terns there. We saw only a few Roseates and a few Arctics in the flock of mostly Common Terns. We added a few more buckets of beach gravel to some uncovered areas of landscape fabric. I expect this to make some enticing spots for Common Terns to nest. We will see. There were no Meadow Voles in the "bucket" trap. Fresh peanut butter was reapplied. One Common Eider nest containing 5 eggs was found on the island. No gull nests were found. We then motored to South Brother but did not land. No tern activity was seen there; only a few Great Black-backed Gulls and a dozen Double-crested Cormorants were to be seen. My crew and assistants: Rémi d'Entremont, Israel d'Entremont, and Raymond S. d'Entremont. May 25, 2010 - All appeared well on N. Brother with an estimated 300 terns in the air and about 100 tern nests - all Common Tern except about 6 Arctic Tern nests. Very few Roseates in the air and no ROST nests yet. 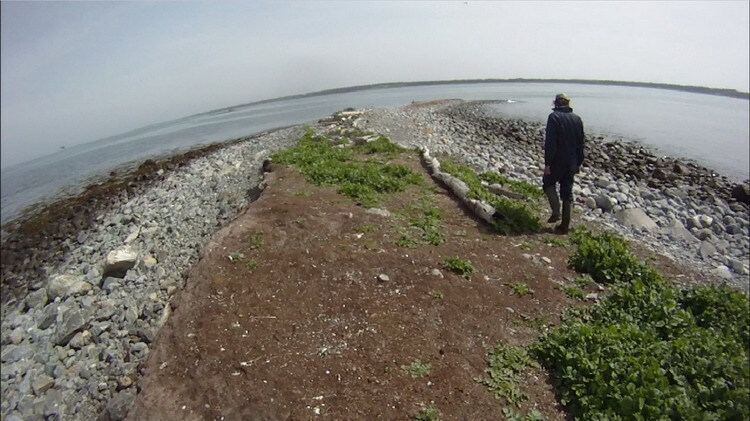 No gull nests on N. Brother, but there were 2 Common Eider nests with eggs. It was a different situation on S. Brother. Even though there were Common Terns in the air as we arrived to the island, we found no tern nests. 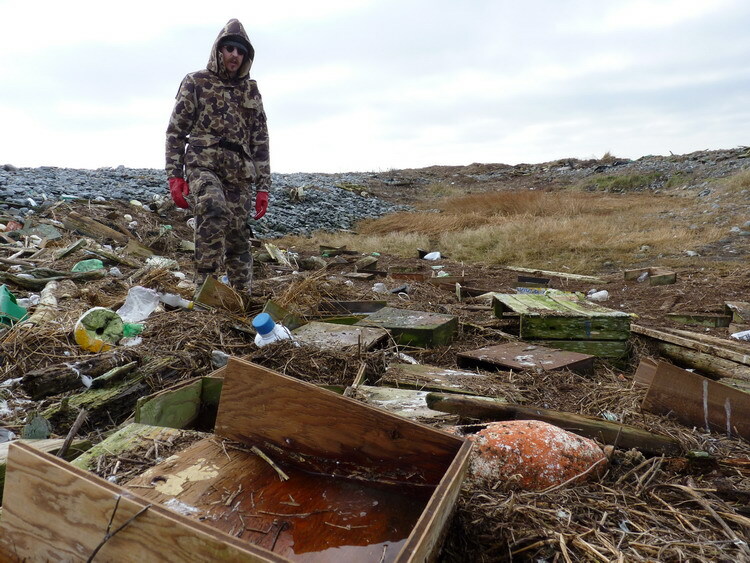 Four GBBG nests with eggs were destroyed and we found no Common Eider nests. The most striking thing on S. Brother is that the land mass is now only about 5 meters (15 feet) at its widest (beach to beach). Very soon it will be gone. 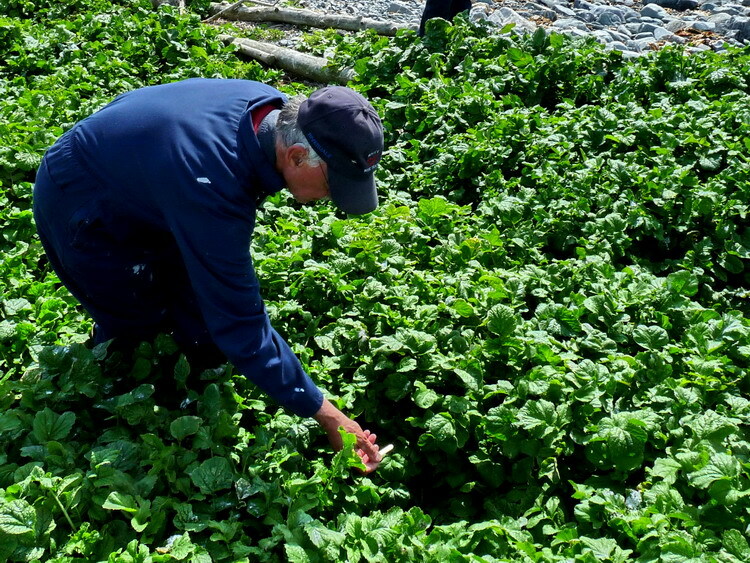 May 25, 2010 - Seaweed harvester, David Surette, reported about 30 tern nests on Île Chespêque in Pubnico Harbour. Also there, were 15 to 20 Common Eider nests with some eggs beginning to hatch. He also reported 3 gull nests, one of which contained a chick as well as one egg. There was also two Willet nests and an unidentified duck's nest comtaining 9 eggs. 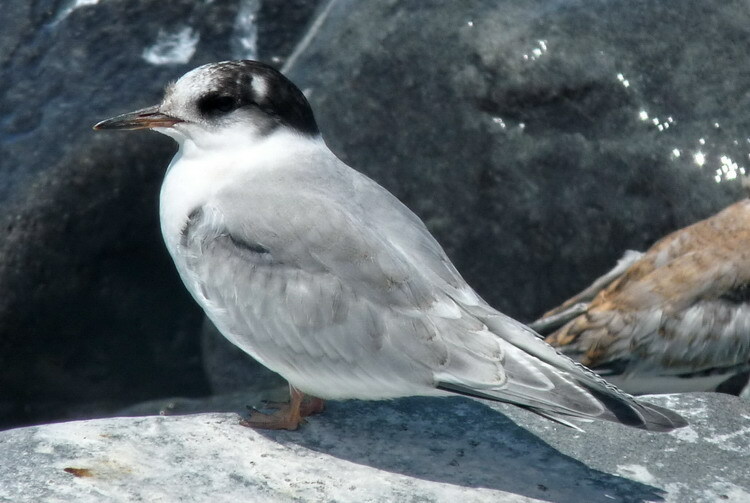 David said there seemed to be fewer terns at Île Chespêque than there were there last year. There were no tern nest found on Île Ferrée. May 26, 2010 David Surette went again to Île Chespêque. He said there were two duck nests containing 9 eggs each. The eggs in one of the nests looked like Common Eider's. In the other 9 egg nest, the eggs were smaller. June 5, 2010 - N. Brother. The tern colony looks great! Hundreds of terns in the air as we arrived. Hundreds of nests with at least 25 being Roseate Tern. One more Common Eider nest (now at 3). There were no signs of predators except for one tern egg with the shell broken into by a beak. I am loking forward to doing a proper nest count in a week or so to see exactly what we have in numbers and to compare this year with previous years. I think it will compare well. My crew and assistants: Rémi d'Entremont, Israel d'Entremont, and Jean Bernard d'Entremont. June 12, 2010 - N. Brother: Nest counting day, 2010. Total tern nests - 714 (including 28 Roseate Tern nests). One Common Tern chick was the only one hatched on N. Brother. 17 ROST nests contained two eggs each, 11 with one egg. I am certain there were more ROST nests in the thick vegetation. They will be difficult to find and identify. The nest counting was very difficult in the vegetated area. The primary plant was a mustard (see photo above). The grasses are gone. Crew and assistants: Rémi d'Entremont, Roland D'Eon and Nigel D'Eon. June 14, 2010 - Île Chespêque, Pubnico Harbour - David Surette reported 51 tern nests. One tern chick had hatched. June 16, 2010 - N. Brother. 5 more ROST nests were found. The total now - 33 in man-made structures. There are more in the vegetation. We rescued a Common Tern, caught by a wing in our "Mink fence". It flew away once released. I will be removing this fence before the next nesting season unless Mink arrive again on this island later this season. We then motored to S. Brother. No terns here, but we found and destroyed 3 more GBBG nests each containing 3 eggs. Crew and assistants: Nigel D'Eon. June 25, 2010 - All is still well on N. Brother. I went there alone, this morning, primarily to read leg bands from the portable blind. I also found 2 more ROST nests in the nesting structures. The current ROST nests now up to 35. There could be more as I did not check all the structures. 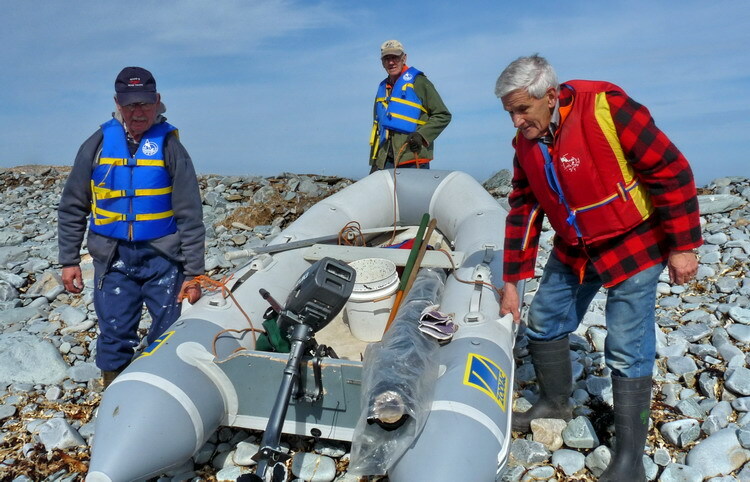 I plan to return on Sunday to N. Brother with a crew from the Bluenose Coastal Action Foundation (BCAF). We will try to do a more thorough search. I counted 7 ROST chicks; the oldests about 4 days old. There were a few COTE chicks found dead, but nothing out of the ordinary. June 27, 2010 - Return to N. Brother with members of the Bluenose Coastal Action Foundation from Mahone Bay, Nova Scotia. Some good news; a little bad news. We identified 3 more ROST nests giving us a total now od 38. One of the new nests was in a nesting shelter; the other two, in the open. We documented 33 ROST chicks. The oldest were about 7 days old; some were 1 day old and there were still about 20 unhatched ROST eggs. Four of these ROST chicks were found dead in the thick mustard vegetation. Three of them had died at about 2 days of age; the other at about 1 day old. All the ROST chicks found in the nesting shelters appeared in good health. On the southern half of the ROST nest shelter area we found a greater concentration of dead Common Tern chicks than we saw on the island in general. I am sure the mortality still falls within the norms at any typical tern colony. The dead ROST chicks were also found in this part of the colony. Crew and assistants: Shannon Page, Alissa Dean, and John Kinley. July 1, 2010 - I was on N. Brother again this morning. I went alone with the portable blind to see if I could read a few more leg bands. Success again. I was able to read three bands. Two were new, one was one I had read last week. The new numbers are 1V/51 AND 92/0E. The colony still looked fine. Today, I did not look for, nor did I find, any new ROST nests. July 8, 2010 - N. Brother. I was in the island this morning. All seemed well. We located a few ROST chicks. One was pretty well feathered and will fly in a few days; another was not far behind. With the present vegetation on the island I expect we will have difficulty finding the chicks on chick banding day. Crew and assistants: Jean Bernard d'Entremont and Michel d'Entremont. July 12, 2010 I motored to N. Brother but, due to heavy ocean swell, I was not able to make a landing. All appeared well on the island, as viewed from the boat. July 15, 2010 - ROST banding day on N. Brother. Julie McKnight and her Canadian Wildlife Service (CWS) crew, Karen Potter and Carina Gjerdrum, arrive to the island on a very beautiful, but a little foggy, July morning. 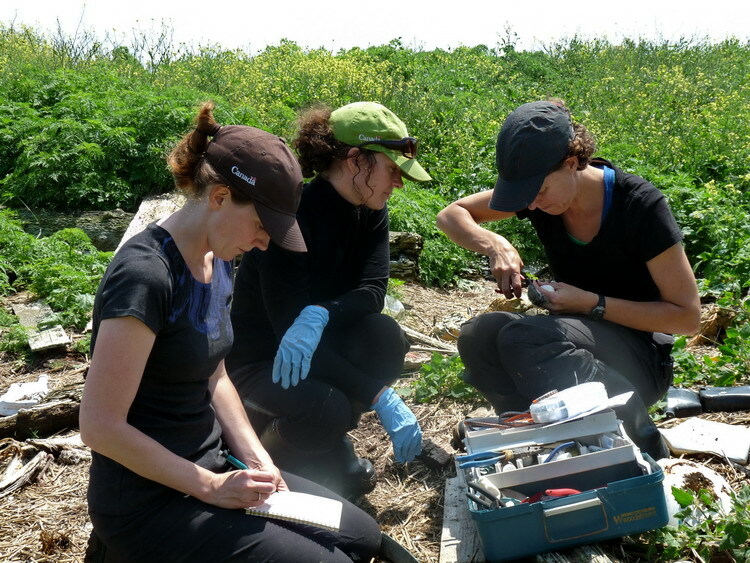 It was very difficult finding the ROST chicks in the thick vegetation of mostly mustard and knotweed. Most of the grasses are gone. 16 ROST chicks were banded, aged from less than a week to already fledged. Two ROST chicks were found dead. 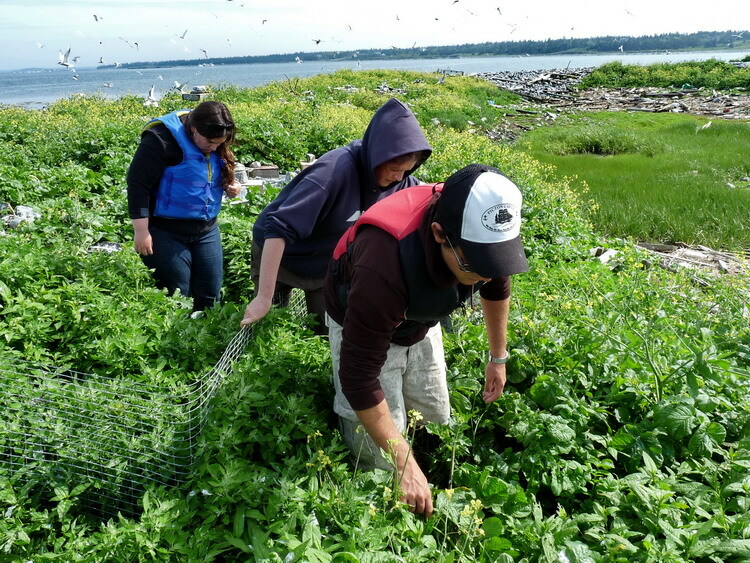 Many Common Tern chicks were also found dead in the thick vegetation, although their numbers were not catastrophic. I believe that when it rains, the area under the vegetation where the tern chicks are hiding, remains damp for a prolonged period of time. Some of the wet chicks die of exposure when they do not quickly dry out. I must say ground level was rather soggy as we were searching for the chicks. I was quite pleased with the 16 chicks which were banded. It would have been great to have banded a few more, but considering the low number of ROST nests this year, I am ok with that. 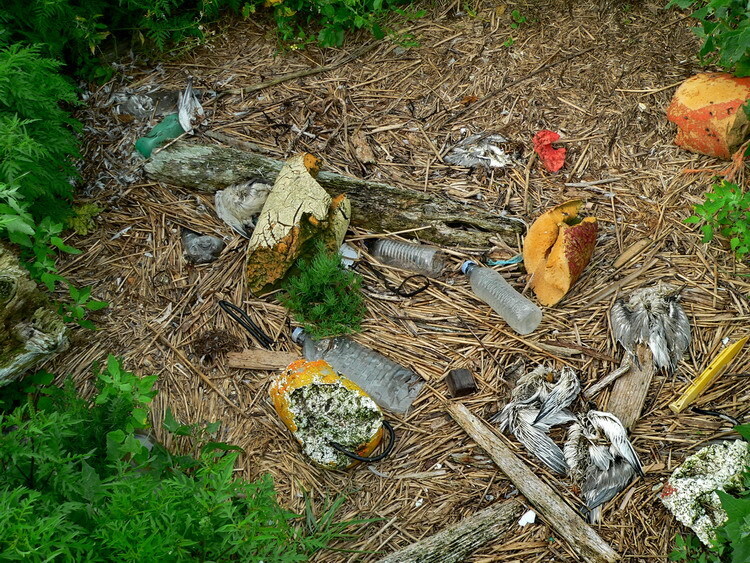 I expect we left another dozen or so unbanded ROST chicks flying around or hiding on the island. 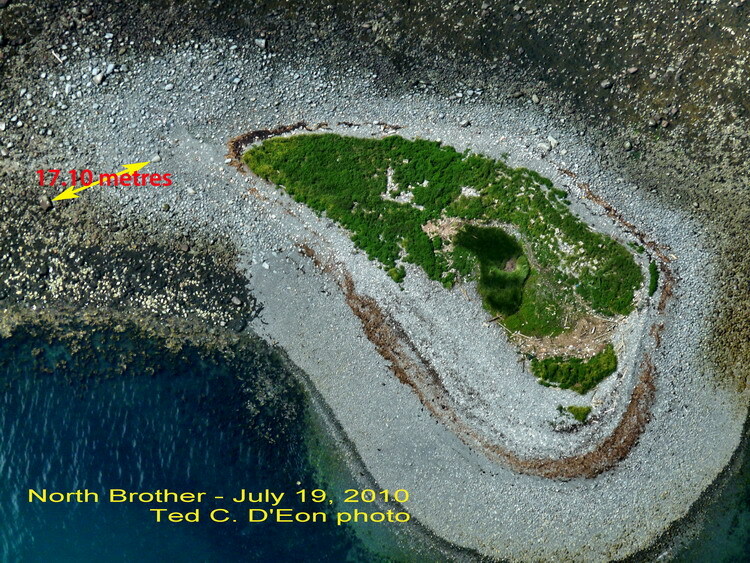 July 19, 2010 - I flew over North Brother in my Powered Paraglider, for an aerial photo update. August 3, 2010 - N. Brother. A quick visit to check out the colony. There was only a small number of terns (maybe 25) left on the island. They were all recently fledged juveniles with a few adults mixed in. Almost all were Common Terns. We did, however, see at least one Roseate adult and at least one Arctic Tern adult. 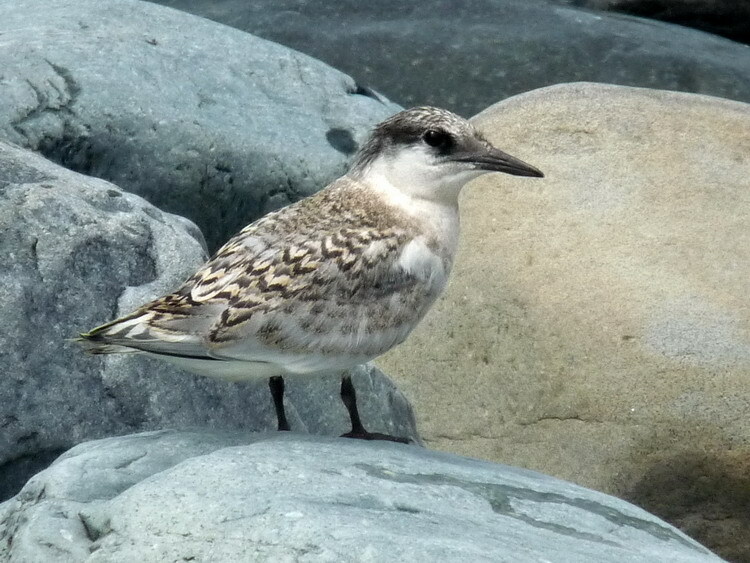 We did not see any Roseate Tern chicks/juveniles. 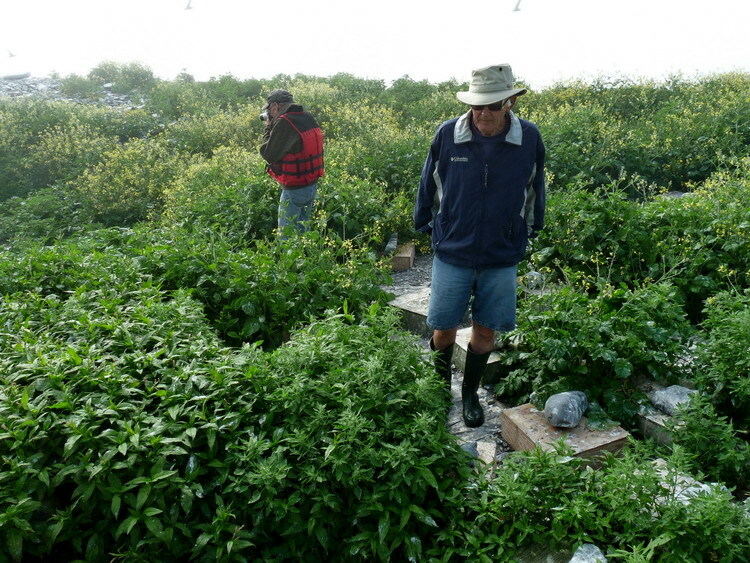 There were no live terns left in the vegetated areas of the island. Crew and assistants: Roland D'Eon, Ronnie d'Entremont, and my cousin, Dale. December 6, 2010 - West Pubnico, 10 am - Very high seas with strong SW winds in Pubnico area. The most erosion I have seen below my house in years. I drove to Pond Rd. 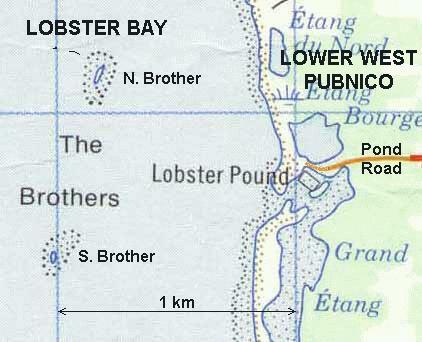 to check out The Brothers from the mainland but the high tide was too deep over the road to safely drive through with the Jeep, I did not see The Brothers; not sure if it was the poor visibility or if they were mostly under water. The water was very rough. I will check them out personally at my first opportunity. December 12, 2010 - N. Brother. Nigel and I motored to North Brother. It was relatively windy but we landed ok. 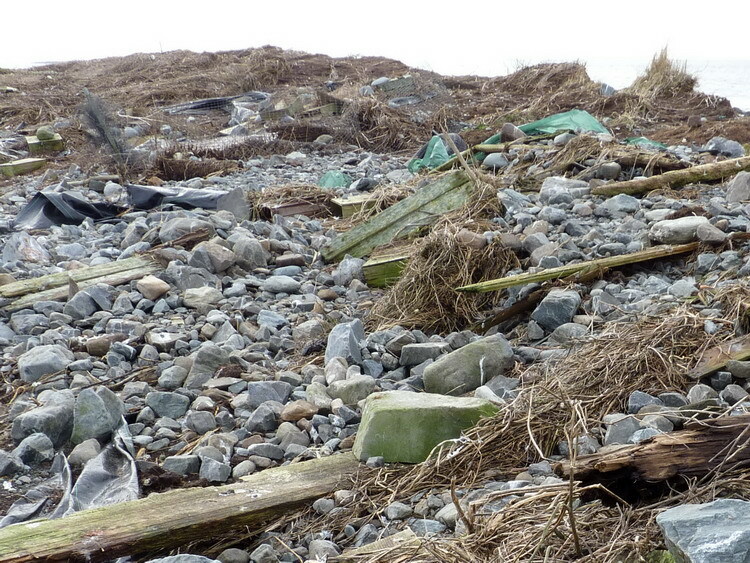 The island looked as if it had been hit by a hurricane! The storm of Dec. 6, hit the island hard. See the photos below of the devastation. They speak for themselves. The "Groundhog Day storm" of 1976 was the last time the island had been hit like this. 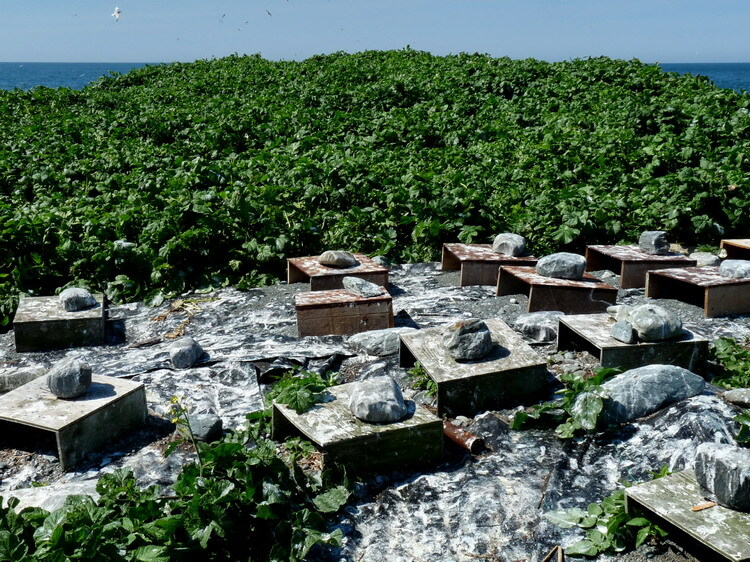 It looks like we will have plenty of work to do on the island in April to get the island ready for the terns arrival in early May 2011. 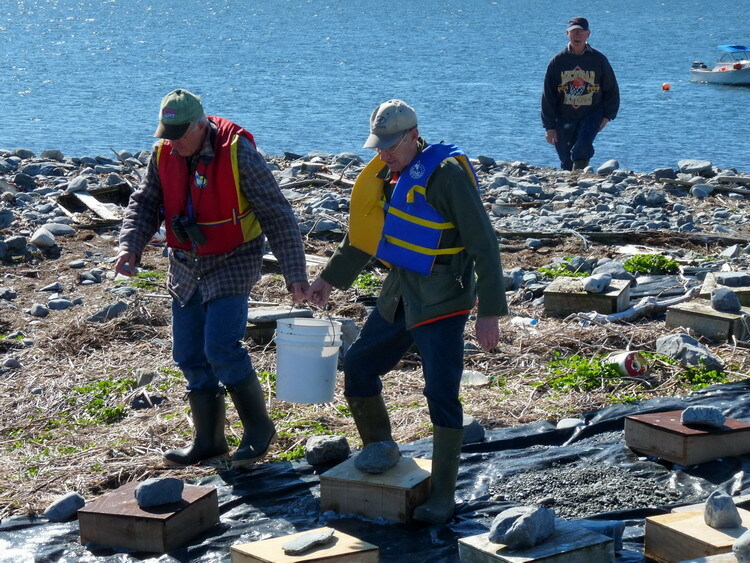 Major restoration will have to be done before May 1st to get the island ready for the terns arrival. 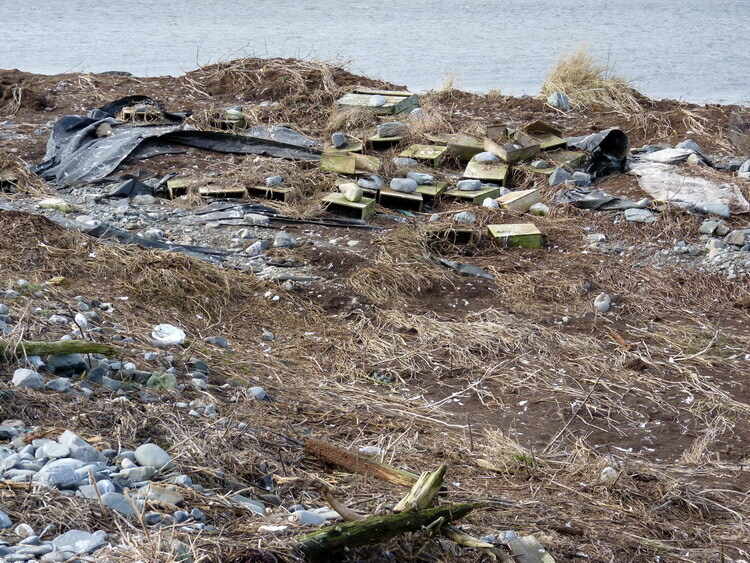 As you can see in the photos, many of the ROST nesting shelters have been washed away from their original placement. Even the landscape fabric suffered extensive disruption. 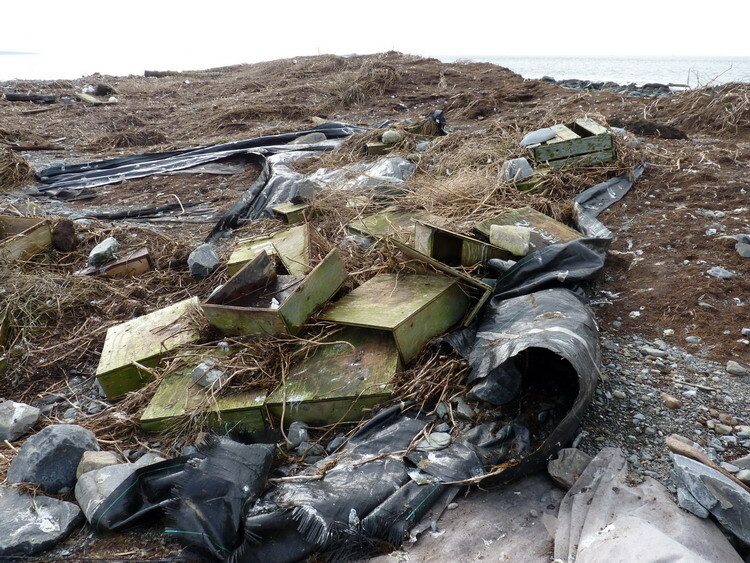 There were many dozens of ROST nesting shelters strewn into the tidal depression on the island; some damaged, some, not. My assistant: Nigel D'Eon (also seen in some of the above photos).